A sprained ankle led to love and a 67-year-long marriage for Selma and Vito Tripi. Over the years they raised five sons, and now have three grandchildren and four great-grandchildren. The only thing missing from their relationship was a traditional wedding …until this past Monday, that is! 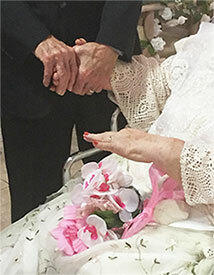 The teenage sweethearts who eloped in 1948 had a vow renewal ceremony at The Palm Garden of Aventura. All wedding day accouterments were present and accounted for, from the rabbi and pastor to music, flowers, a trip down the aisle, wedding bands engraved with the words, “Love You Forever,” donated by J.R. Dunn, kisses, and a reception with wedding cake, sparkling cider and Hershey’s kisses. The Tripis are a fine example of opposites attracting. They are of different religions, political views and hobbies, none of which matters! 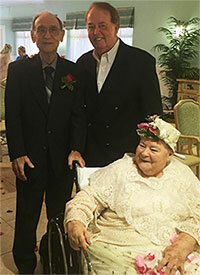 The vow renewal was coordinated by Zita Willensky, the life enrichment director of Palm Garden, where Selma lives and Vito is a daily visitor.